It’s that time of year—when articles and commentary on email-marketing industry trends abound. 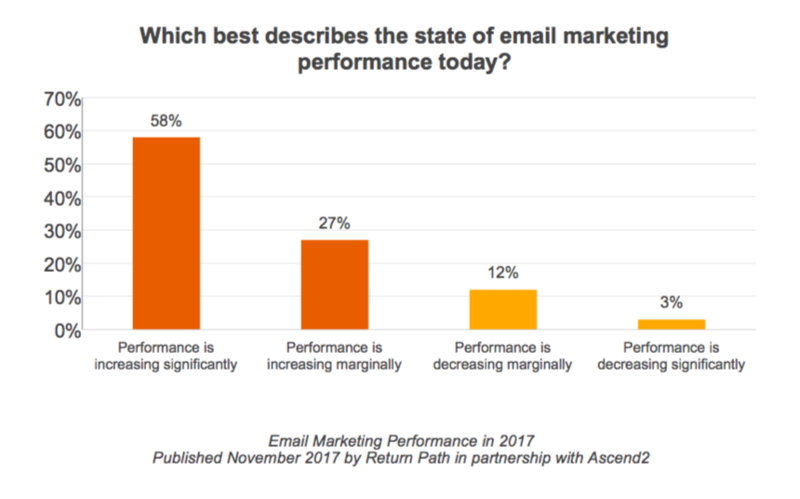 Which trends will have the biggest impact on your email campaign performance and return on investment (ROI)? Here’s our take on the top trends, plus some useful tips and resources for how to easily implement them into your email-marketing strategy for 2018 and beyond. When it comes to marketing channels, email still rules in terms of performance and results. 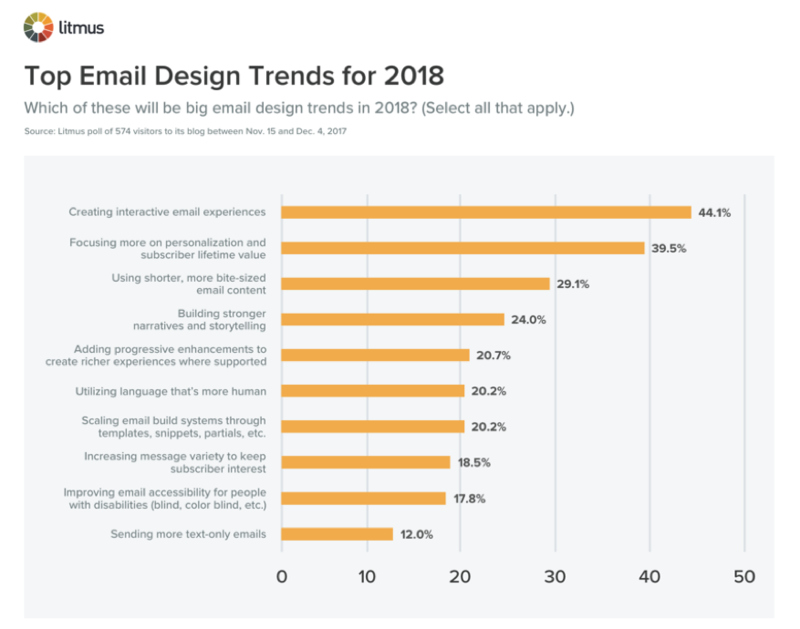 Here are a few recent studies that not only demonstrate email’s prowess, but also give a good indication of emerging industry trends. 95% of marketers said that email is “important” or “very important” to their businesses. When asked what email is best used for, the respondents said: retention (31%), conversion (24%), brand promotion (21%), customer acquisition (14%), and customer reactivation (8%). Respondents reported that email delivered 30:1 ROI, on average. More than 90% of respondents said that their email-marketing strategy succeeds at achieving their important objectives. Email message personalization was rated as the most effective email-marketing tactic by 44% of survey respondents. Other effective tactics included social sharing (41%), meaningful call to action (38%), testing and optimization (36%), list data segmentation (32%), mobile-responsive design (31%), and automated campaigns (19%). What’s Trending Now in Email Marketing? 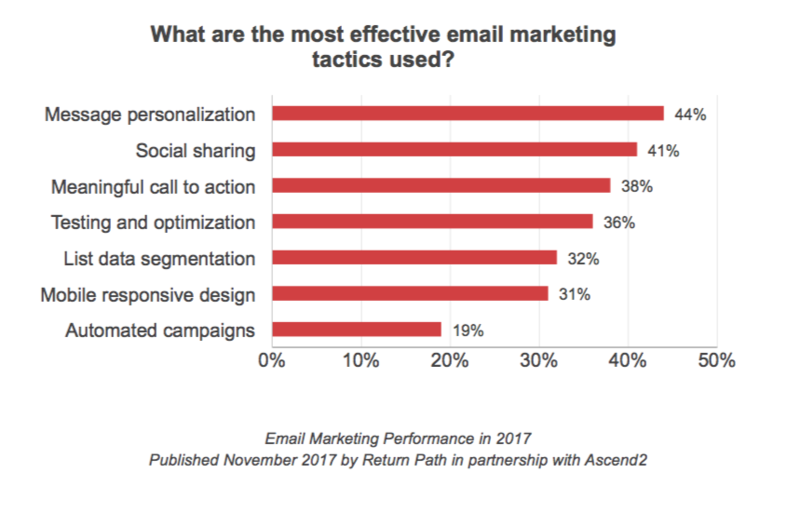 To create the following list of trends, we chose email-marketing practices that—when implemented and optimized—are likely to have the biggest positive impact on email performance and ROI in 2018. You’ll note that some of these trends are new and some are not, but what they all have in common is the great potential for taking your email campaigns to the next level. Predictive marketing is one of the biggest buzzwords and hottest topics in email marketing today. That’s because it’s one of the most powerful techniques for building profitable, long-term relationships with customers. By leveraging predictive marketing, you can analyze customer data (e.g., website browsing behavior and purchase history) to better understand your customers’ interests, habits, and needs, as well as their likely response to your email content and messages. In this way, you’ll make smarter, more data-driven decisions that will ultimately give a big boost to your email performance and ROI. Use predictive analytics to create segments of your new subscribers. Then, rather than sending the same welcome email series to every new subscriber, send each segment a welcome message that contains more targeted and relevant content and offers. Focus predictive-marketing efforts on your best customers—those subscribers who open, click, and convert most: They may represent only a small percentage of your subscriber list, but they likely account for a significant portion of your sales and revenue. Use predictive analytics to keep customers engaged—and to reengage customers who haven’t purchased from you in a while—by creating emails that are sent at the right intervals and with just the right discount incentive to motivate a purchase. Part 1—What Is Predictive Marketing and How Does It Fit Into the Email-Marketing World? AI and machine learning go hand-in-hand with predictive marketing in gaining insight to your customers’ interests and needs to deliver a customized email experience. Although you already may be using multivariate testing, AI- and machine learning–powered testing platforms can help you perform more robust testing. And with more detailed analyses, you can identify customer trends faster and be able to react in real time. In this way, AI can help you determine the subject lines, email content, and calls to action that will get the best open, click, and conversion rates. The AI marketing solution Phrasee, for example, claims that its AI-generated subject lines outperform handwritten ones 95% of the time. This is just one example of how AI can optimize email-marketing campaigns. Another is machine learning, which can be harnessed to determine the best send times, frequency, and cadence to maximize conversions. And yet another is driving more revenue from campaigns by predicting which promotional offers work best for individual customers. Get ready for AI by organizing and integrating your current customer data. Start gradually and build your AI capabilities by getting in place the right platforms and tools so you can take advantage of the technologies as they become available. Adding dynamic content and kinetic design elements to your email campaigns can boost engagement and increase conversions by reducing the friction in the buyer journey. For example, interactive emails include such features as hover-over animations, carousels and rotating banners, games, quizzes and surveys, and HTML5 video players, as well as click-to-purchase and add-to-cart functionalities. Thanks to these interactive design features, your email subscribers won’t have to click a link embedded in your email to see more relevant content and product choices, watch a video, or make a purchase. Instead, you can provide more of a website experience for your subscribers within the email itself. And the good news is that kinetic design and interactive functionality are now supported by the email clients that most of your audiences use. Be sure the interactive design elements that you add to your emails don’t distract from your email, but rather do a better job of displaying your products and strengthening your message. Integrate fallback layout functions so that your interactive design elements render well, even in email clients that don’t support the technology. Test to be sure that your specific audience appreciates kinetic design and will take advantage of the opportunity to interact with your brand within your emails. What’s Kinetic Email and Why Should You Use It? In GetResponse’s report Email Marketing and Marketing Automation in 2017, 65.5% of marketers said that they currently use basic automation (e.g., welcome email series), 32.8% use basic profile-based targeting, 25.4% use dynamic content to personalize their emails, and only 11.8% use more advanced automation techniques. Securing the budget (36.1%) was the top challenge that marketers said stood in their way of adopting marketing automation. As email-marketing automation platforms offer more sophisticated tools at lower prices, more organizations will be able to take advantage of the advanced technology to deliver more relevant and personalized email campaigns, efficiently convert prospects to customers, and keep current customers more engaged. And keep in mind that automation tools can be used to substantially reduce your production costs of daily, weekly, or other regular deployments. Let your subscribers manage their preferences, which will help you determine and create highly effective segments. Select the right automation software from the start by making a list of the features that you need, and consider only solutions within your budget and that aren’t offering costly features that you won’t use. Thanks to advances in predictive marketing, AI, and automation, it will be easier and more cost-efficient than ever to personalize your email campaigns. A Yes Lifecycle Marketing 2017 study showed that personalized subject lines had 50% higher open rates and 58% higher click-to-open rates compared to subject lines that were not personalized. However, only 2% of the 7 billion emails studied had personalized subject lines. Personalization in email marketing goes beyond simply using a subscriber’s name to deliver more relevant, 1-to-1 email messages. And email list segmentation has been proven to be among the most effective ways to create more targeted emails. For example, research by Campaign Monitor showed that segmenting email campaigns to deliver more personalized content increased revenue by an impressive 760%! Personalize your subject lines with such types of information as the recipient’s name, previously purchased or browsed products, items from abandoned carts, loyalty-program updates, and membership milestones. Segment your email lists using demographic (e.g., age, gender, income), geographic, and behavioral (e.g., products browsed and purchased) data. Personalize your website landing pages, too, so that they have a look and tone consistent with the email message, as well as the same personalized call to action. If you’re not already optimizing you emails for mobile, it’s time to start, because the majority of emails are now read on handheld devices. In fact, 40% of consumers said that their mobile phone is their primary device for checking email, according to a study published in 2018 by The Relevancy Group. And according to a 2017 study by Return Path of 27 billion emails, 55% of email opens occur on mobile devices. So, keep your mobile users in mind for your email design! Tighten up your email content so that it’s shorter, more concise, and easier to read on mobile devices. Use responsive design to help ensure that your email messages display correctly on any screen on which they’re opened. Think BIG for font size and call-to-action buttons for easy reading and clicking. Don’t use too many images and be sure that the ones you do include in your emails aren’t so large that they slow the download. Also known as autoresponders, triggered emails are an effective and cost-efficient way to nurture new subscribers and keep customers engaged with your brand. Welcome emails for new subscribers, abandoned-cart–recovery emails, and post-purchase reorder emails are examples of campaigns that can be “triggered” to send based on the subscriber’s behavior. One of the greatest things about triggered email campaigns is that once they’re set up, they continue to automatically reengage leads and drive revenue from customers without any input required from your marketing team. Set up your triggered welcome campaigns to be sent immediately after a prospect subscribes. Test and optimize your trigger campaigns to continually improve your conversion rates, looking at such elements as subject lines, calls to action, cadence, frequency, and incentives. Transactional emails (e.g., shipping and delivery confirmations, receipts, password resets) are among consumers’ most desired messages and are as much as 8 times more likely to be opened compared to marketing emails sent from the same company. So, how can you capitalize on the popularity of these emails to boost your email performance and drive more sales and revenue? Simply add a marketing component (such as discount offers and coupon codes to be put toward a future purchase), product recommendations, and sales announcements. Use branding consistent with the rest of your email campaigns (e.g., logo and brand colors) in all of your transactional emails. Populate your transactional emails with product recommendations based on purchases made by other customers who have purchased the same item. This is a great way to cross-sell and upsell products that customers are likely interested in buying. Target the right people with the right products using recommender blocks in your email marketing. Email recommender blocks are dynamic images in your email template, which can be displayed in a thumbnail, and provide other product information (e.g., product name and price). In addition, recommender blocks can be coded to render in real time—when your recipients open their emails—showing the most relevant and up-to-date product recommendations for different customer segments. Base your product recommendations on browsing behavior or recent purchase history. Use recommender blocks in such email campaigns as abandoned-cart recovery and post-purchase. Be sure to use alternative text for your product recommendation images so that the product information (e.g., product description and price) is spelled out for recipients who don’t download the images. Integrating chatbots with your email marketing is a great way to grow your email list and increase the touch points that your company has with prospects and customers. What are chatbots? Basically, they are computer programs that are designed to simulate human conversations and interact with users via text (e.g., through pop-ups on your website). And thanks to the evolving technology of Messenger, people can also connect with your brand via chatbots beyond your website, such as in Facebook Messenger. Chatbot: We hope you found this article useful. Enter your email address to receive our free monthly newsletter for access to more articles like this. Chatbot: Thanks! Watch your inbox for our most recent issue! Keep it simple. In other words, don’t overload a chatbot with a bunch of features and tasks. If your goal is to collect email addresses, do just that. Make your chatbot’s tone conversational and helpful. Regularly test and optimize your chatbot for content and timing. Looking to Give a Boost to Your Email ROI in 2018? 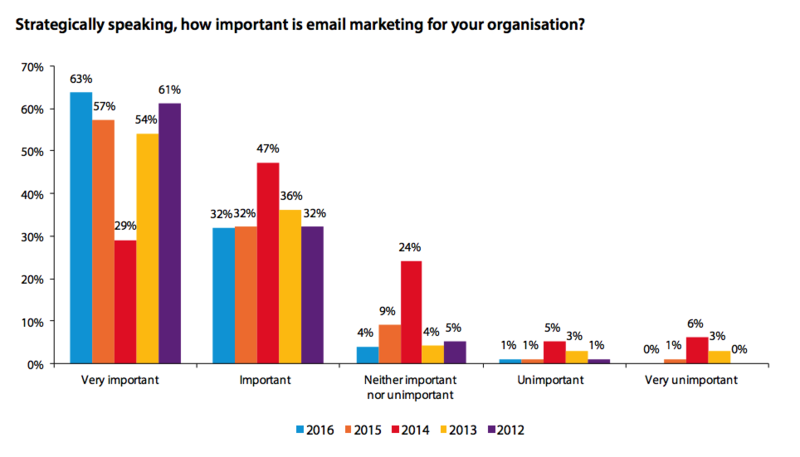 Are you satisfied with how your email-marketing campaigns performed last year? If you’re looking to increase revenue and improve your email-marketing ROI in 2018, FulcrumTech can help. Last year, we helped our clients achieve fantastic online growth, including triple-digit improvements year-over-year, as well as online sales records for the best day, best week, and best month ever! Contact the email-marketing experts at FulcrumTech and get started today!